3.8 out of 5 based on 34 bloggers and 4 commenters. 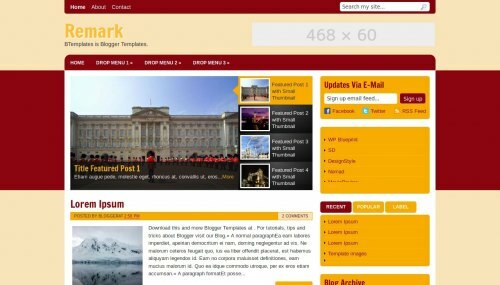 Remark is a free blogger template with 2 columns, right sidebar, rounded corners, an exclusive design for Blogger, ads ready, footer columns, slider, social bookmarking icons, posts thumbnails, tabs and drop down menu. as a social worker I would like to have a good and professional website that can provide a perfect impression for the survival and development of social institutions that I lead in the future. Which codes i have to change to extend the sidebar of this template from 200px to 300px? olá, estava a procura de um teplates assim posso utilizar esse sem nenhum problema? olha tem alguem codigo que tenho que usar ao postar video nele?